Rocket From The Crypt fans who’ve been patiently waiting the past seven years for reunion news won’t know whether to rejoice or be enraged at the news that the long-running punk act—including original drummer Atom Willard—is back in action. The catch? It’s for Nickelodeon’s Yo Gabba Gabba! The band made what it’s tipping as its only reunion performance ever performing an original tune, “He’s A Chef,” which mostly touches on themes such as making pancakes and garnishing dishes with parsley. The band’s appearance on the “Super Music Friends Show” segment was probably inevitable, as singer-guitarist John “Speedo” Reis plays the show’s host, The Swami, and helped introduce other musical guests such as The Flaming Lips, Devo, and The Faint. 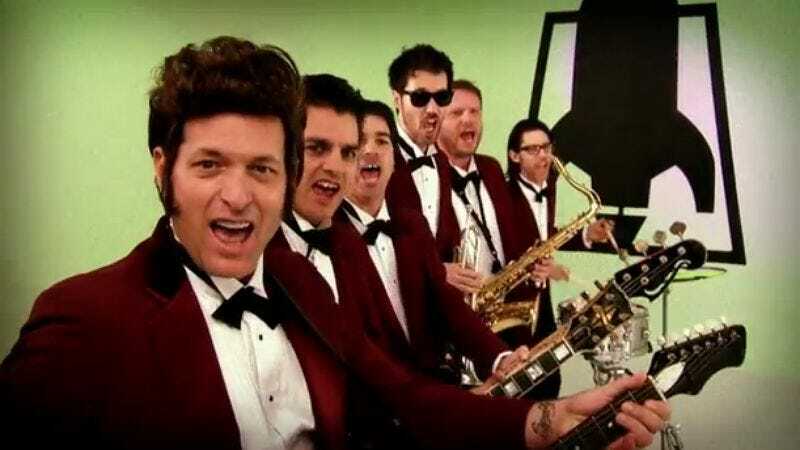 The song’s set to air sometime in the act’s fourth season this fall, but RFTC completists can pick up a 7-inch of the song at Volcom Clothing stores starting Sept. 21 as a gift for purchasing Yo Gabba Gabba! Volcom merchandise, because nothing screams punk-rock legitimacy like Nick Jr.-related cobranding efforts.